WWI is over but a gloom still hangs over London. Lotty and Rose are two housewives who need some enchantment in their lives. Impulsively, Lotty answers an ad in the paper that reads, “Small castle on the Mediterranean, Northern Italy. To be let for April. Cook, gardens, ocean view.” And so their adventure begins. Recruiting two other women in need of escape, they dive into the experience of a lifetime, rediscovering themselves among the wine, wisteria and sunshine in a play that is timeless, funny and joyfully restorative. 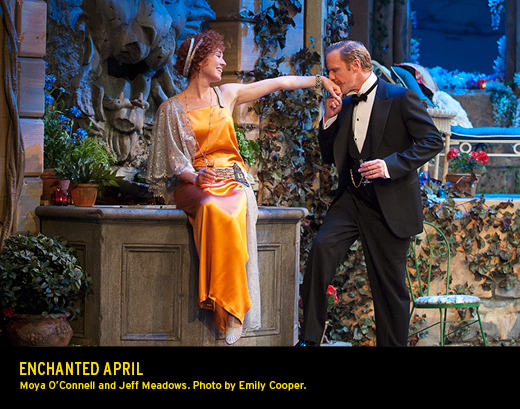 Enchanted April was presented at the Shaw Festival in Niagara-on-the-Lake, Canada as part of their 2013 season. The production was directed by Jackie Maxwell and designed by William Schmuck, with lighting design by Kevin Lamotte and original music by Zachary Florence. Beatrice Campbell was the stage manager and Ivory Seol was the assistant stage manager. The production featured the following cast: Moya O’Connell (Lotty Wilton), Tara Rosling (Rose Arnott), Marla McLean (Caroline Bramble), Donna Belleville (Mrs. Graves), Jeff Meadows (Mellersh Wilton), Patrick Galligan (Frederick Arnott), Kevin McGarry (Antony Wilding) and Sharry Flett (Costanza).